In recent years, computational methods have led to new discoveries in the field of historical linguistics. 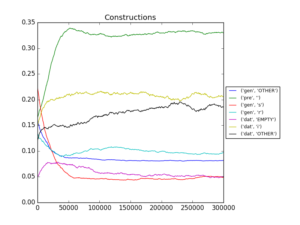 In my thesis, I applied the machine learning paradigm, succesful in many computing tasks, to historical linguistics. I proposed the task of word prediction: by training a machine learning model on pairs of words in two languages, it learns the sound correspondences between the two languages and should be able to predict unseen words. I used two neural network models, a recurrent neural network (RNN) encoder-decoder and a structured perceptron, to perform this task. I have shown that, by performing the task of word prediction, results for multiple tasks in historical linguistics can be obtained, such as phylogenetic tree reconstruction, identification of sound correspondences and cognate detection. On top of this, I showed that the task of word prediction can be extended to phylogenetic word prediction, in which information is shared between language pairs, based on the assumed structure of the ancestry tree. 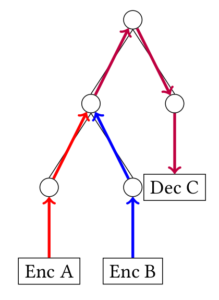 This task could be used for protoform reconstruction and could in the future lead to the direct reconstruction of the optimal tree at prediction time. The thesis was supervised by Gerhard Jäger (SfS, University of Tübingen) and Jelle Zuidema (ILLC, University of Amsterdam). 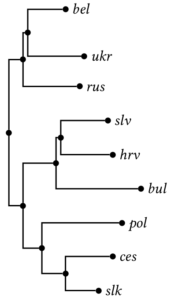 I developed an agent model of historical change of the genitive in Germanic languages. Data from the Icelandic saga corpus was used, to initialize agents with an Old Norse language model, representing an ancestor of current Scandinavian languages. In some experiments, language contact between Scandinavian and Middle German agents was simulated. Simulations tend to converge to situations observed in current Germanic languages. This was a course project, in which I collaborated with other students, for the MA course Variation and Change in German/Variation and Change in Scandinavian Languages at the University of Amsterdam, taught by prof. dr. Arjen Versloot. In my BSc thesis, I explored a topic in dialectometry: using bayesian inference to create a kinship tree of Dutch dialects. I used data from the Reeks Nederlandse Dialectatlassen. The words were aligned and converted to phonetic features, in order to be processed by a bayesian inference algorithm. 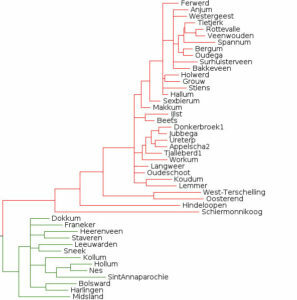 The resulting tree was compared to an existing Dutch dialect map. The thesis was supervised by Alexis Dimitriadis and Martin Everaert from UiL OTS. I maintained the TREC OpenSearch API for the ILPS research group of the UvA. TREC OpenSearch is a project which enables information retrieval researchers to evaluate their search result rankings on users of real websites. Site administrators are in turn able to use technology based on the latest research.